There are 15 countries in the GHCN country list for South America. So the puzzle is how to assemble those individual profiles to make this “smooth warming out of a dip” profile. 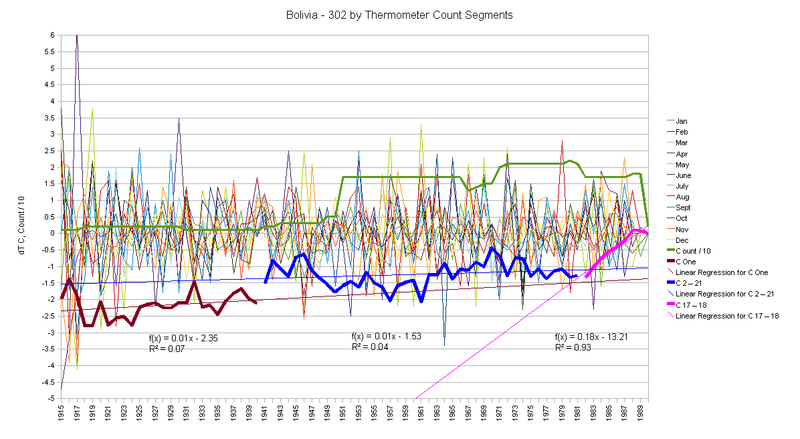 302 – Bolivia, 88-90 has lots of holes, then ends. They, too, produce CLIMAT reports. Though as we’ve seen in other cases, these can have interesting “texture” inside that overall trend with things like step functions or a drop at the start before the GIStemp baseline that would still leave a ‘warming trend’ in the part of time that GIStemp chooses to use. Uruguay – Free Basing on the Baseline? One very fascinating case is Uruguay. At first I thought it was missing, but I’ve since found that I’d left it behind in moving reports from the Linux “Analysis” box over to where I was making graphs. Inspection of the graph is very interesting, and I think it has shown me a new “Trick”. Notice that blue negative trend cold period? It is EXACTLY on the GIStemp baseline. We pop up to a bunch of stations then, stir them around a bit near the end, and then selectively drop a few of them on the exit. The net effect is to put a nice “dip” in the middle, and a rising trend at the end, with the temperature being roughly the same now as it was in the 1940’s and 1800. Neat Trick. More than enough to blend in with the surrounding places and smooth the hockey stick… We’ll see as I get graphs made just how much “sticking” each one provides. Inspection of the tables gives an idea what will happen, but not exactly how the picture will look. We’ll start with Brazil. It’s large and dominates the middle of the continent. Any evidence for a bit of a Hockey Stick here? Here we see a common feature, that drop at the start of time, then a long flat phase. I’ve not bothered to break them out for this “Segment by Thermometer Count” graph. We also have another feature we’ve seen once or twice before. The “Two Step” where we have a “step function higher” in 1980 followed in 1990 by a “ramp higher”. We again get the “pinch” of volatility in the transition just about 1990 and we have a dramatic clipping of the negative going peaks after the pinch. Something in that changed process of 1990 clips cold peaks out of the data. I’ve left those two segments concatenated as well. Brazil has more of a ‘drift’ of thermometers in and out of the record, so picking clean breaks by thermometer count group is a bit clumsy. This way you can just admire how a long mostly flat history “pivots” in 1980 and makes Hockey In The Jungle. The other players in The South American League? 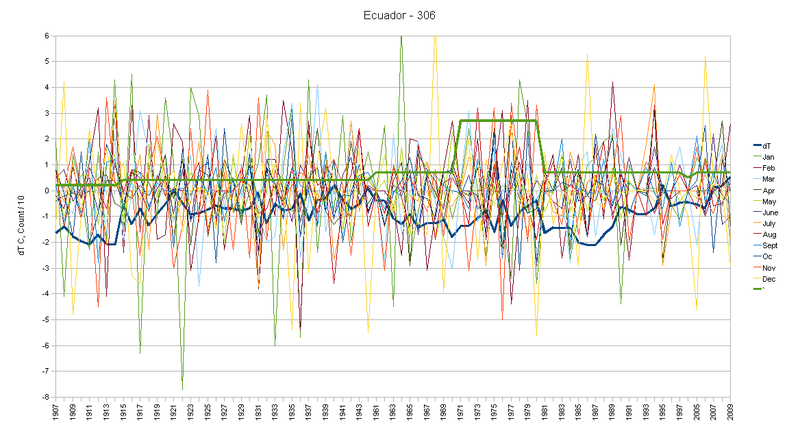 A long more or less flat period (though volatile) with a dozen or less thermometers. A “Step Function” up to another slightly tilted segment as thermometers jump to the 50’s and get moved around a little, then a perfect “bullseye pinch” with a small step up but a truly wonderful “warming trend” baked in via clipping the low temperature peaks more than the highs (That ‘white space’ between -1.5 and zero being larger than the white space between 0 and 1.5 after 1990). With the number of thermometers slowly drifting down. Could probably milk this for another decade with careful thermometer removal. We have hints of the Step in 1980 but it’s only good for about 1/4 C and we have the “pinch” of near zero volatility, but again, good only for 1/4 C (and that with a lot of slop in it…) Though I must point out that even a cooling place can contribute to “Global Warming”. Notice that deep dip? Look at the dates. About 1951 to 1980. 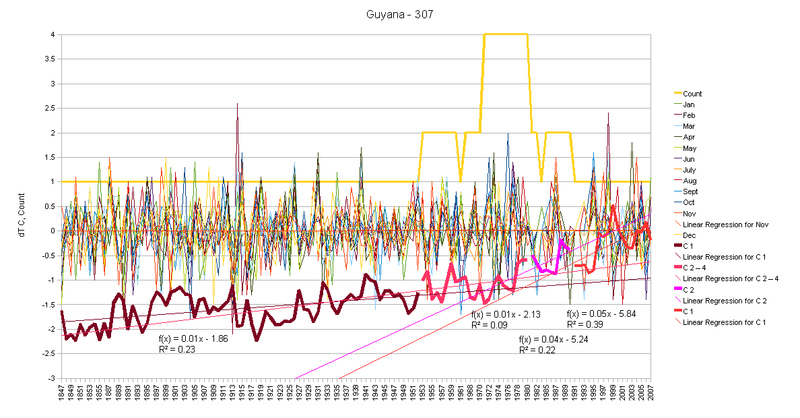 EXACTLY the GIStemp baseline… So when compared to French Guiana in The Baseline, we will find that the rest of French Guiana history has “warming”… So here we have “How to turn 2 C of cooling into 1/2 C of warming” in one easy lesson. Such a wonderful trend. And sandwiched right between the French and Guyana. We have the “bullseye” pinch of volatility in the monthly anomalies at the 1990+ change, but the best it could do was a slight drift higher. Not enough to really matter. I’d put it at about 1/4 C midpoint to midpoint. We’ll need to watch it, though, and see if enough accumulates over time to matter. After the Pinch we have a reduction in volatility to the downside out of proportion with that to the upside, so there is some “warming” built into the process, just not enough to get to an overall positive change… yet. Does Columbia Feel The Heat? Well, over all darned flat. A nice new trend started from that “bullseye” 1990 change with good slope to it, but still no more than the 1940’s. Yeah, more than the 1951-1980 baseline of GIStemp. Has potential for the future maybe…. So a bit of a stick, but not very impressive… Maybe all the “holes” in the data can get some better “in-fill” from somewhere else in GIStemp. I’d have considered putting Peru on The Hockey Team, but it’s definitely just in the C league farm team category. We have a new rising trend, now that we’ve had some thermometers dropped, but they were dropped after most other folks already had their dropping out of the way. So much work to get a trend going, then it got dropped? So we have a step function higher as a bunch of thermometers were added, but they were added in the baseline. Doh! Then we get a Great Change Of Trend with that 1980 change, just a Rocket Ride. And it gets dropped on the floor. Doh Doh! With Argentina right next door serving as a good example, this is the best you can do? Don’t really know what to do with that. Warmed, but long ago. Then cooled. But now it’s in a warming trend, but not more than it cooled before. Guess that’s just some oscillation thing going on. Interesting to look at, though, and not what CO2 Theory would predict. Oh Dear! Seems to have been getting a mite cold down south… wonder if that’s why it suddenly ended in the 1980’s?. Wunderground has them at 39 F as I type… Still cold. This entry was posted in dT/dt and tagged GHCN, GIStemp, Global Warming. Bookmark the permalink. 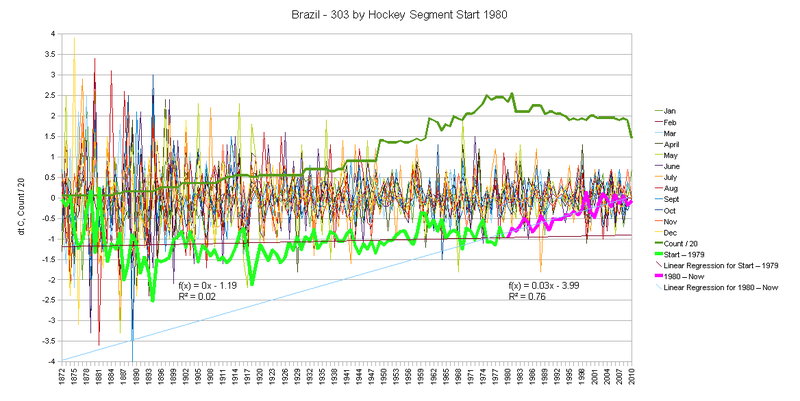 19 Responses to South America – Hockey in the Jungle? It looks like we are rapidly reaching the point where we have to figure out how GISTEMP is getting it wrong. 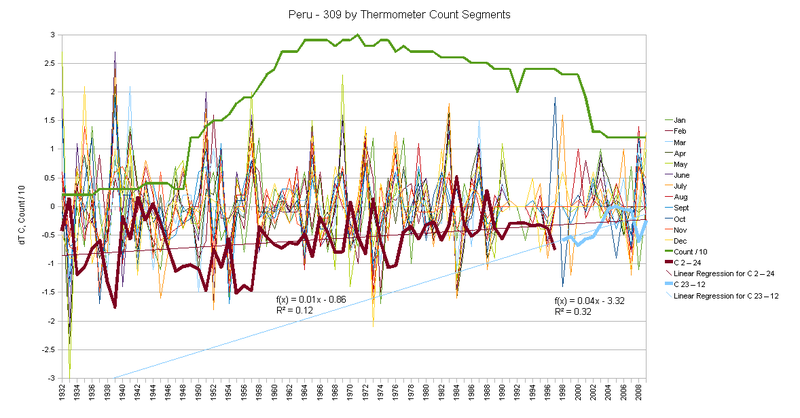 It might be that “global temperature” is something that the information (temp time series) doesn’t lead comfortably to and that trying to get there with the data you’ve been examining requires too much effort for the data to survive – over cooked. But then i think you’ve said this. 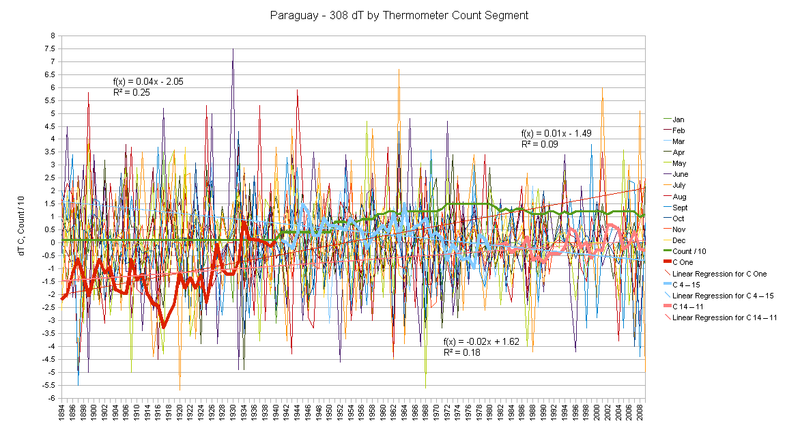 I present temperature averages (especially in some of the earlier work were I was trying to see just how much the data change would bias the results, what I call “characterizing the data” – really what my old FORTRAN professor called it a few decades ago) but there are “issues” with averaging them. It’s OK to average an intensive variable to find out about the structure of the data but it is a complete waste of time to do it to find out about what the data means. A simple example of this is the coins in your pocket. If you double the number of coins in your pocket you CAN say some things of value. You can say you have more money than before the doubling (provided none left…) and you can even say your pocket will be heavier. You can say it will take longer to count your money. But you can not say how much money you have. To do that, you must look at the denominations. (This becomes even more important if you take some coins out and then put some others back in… then you can’t even say that more coins means more money…) Similarly, dumping a pot of hot water into a pot of cold water tells you nothing about the final temperature. For that you need the masses too. And if some of the liquid is not water, then you need specific heats too. So right out the gate, thermal energy is an extensive variable (and what we want to know about) but we use temperature as a proxy for it (an intensive variable) and then we try to treat it as something we can “average” and have meaning about either heat or final temperature. And we just can’t. It is a simple fools errand. 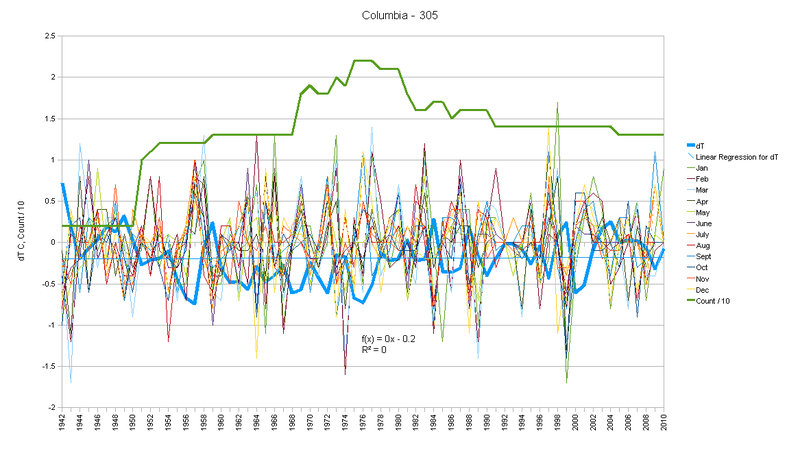 The temperature data, even if clean, would not tell us about heat. If averaged, it would tell even more lies. 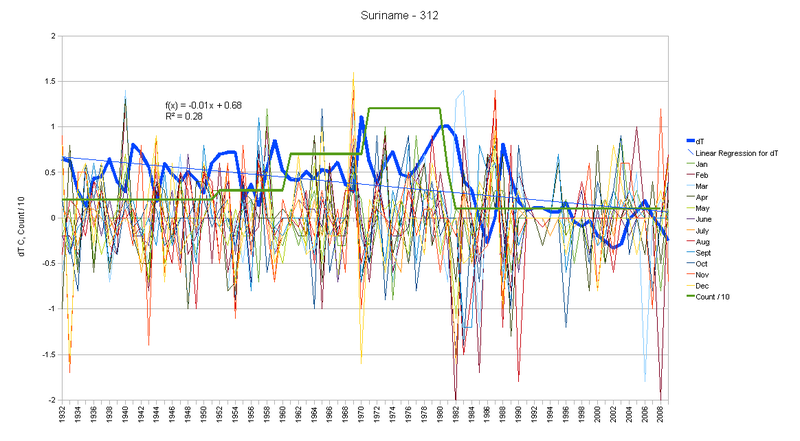 So somewhere in the bowels of GIStemp is some bit of code doing a really dumb thing inside the context of doing a dumber thing (Global “Average temperature” – the oxymoron) and it makes some very very bad results. (All those A / B blink charts showing homogenizing that makes cold trends warm and changes the past; and all those showing UHI “correction” that goes the wrong way.) And yes, I ought to get back to it someday to figure out exactly ‘what bits’ are messed up. E.M.; you sure hit the nail on the head with the above. The satellite sees heat in the troposphere and we see snow on the ground. 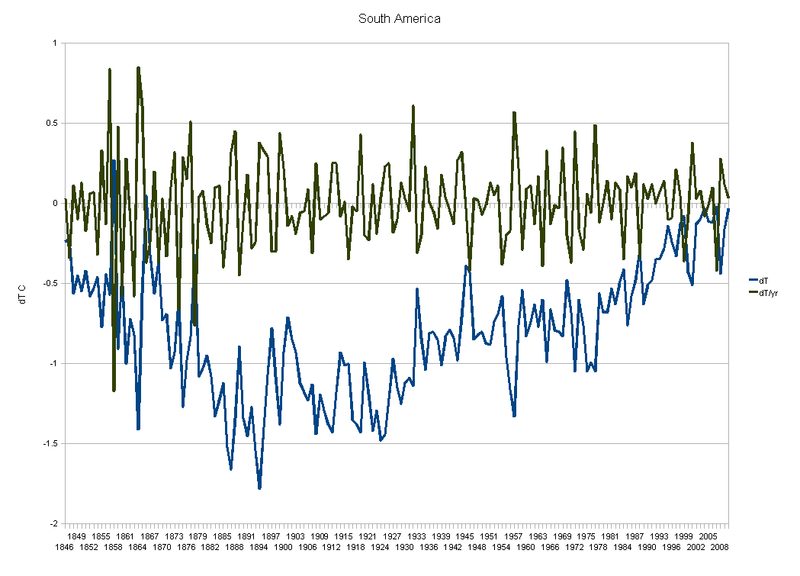 The AGW people see global warming and the dumb little people on the ground see a cold miserable winter. The Sun transmittes Energy. Temperature of the air 6 feet above the ground is a damn poor proxy measurement of the energy balance of the earth. What you say above is quite clear. Why not consider these things in terms of mass times temperature? Likely it would be very difficult and where would you stop – center of the earth? I suspect that you will find that the “heating” is not only in the way step functions in the raw data are dealt with. it will turn out to result from an unfortunate combination of handling step functions (do they ever step down? 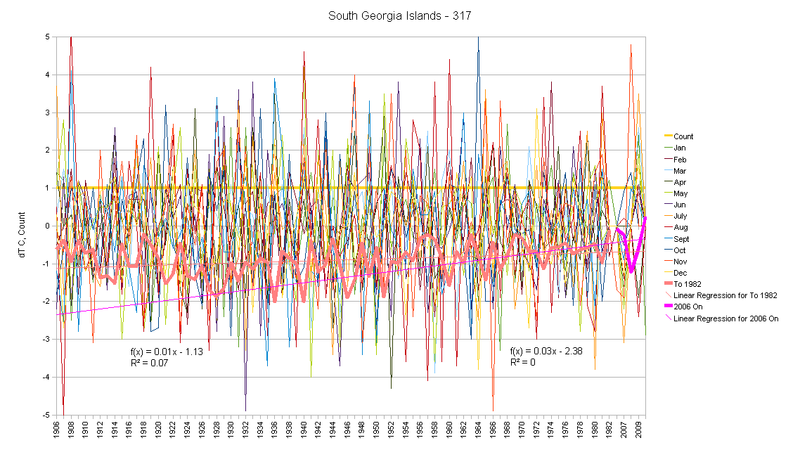 ), station drop outs, uhi, and the changing (is it evolving) constituency of the thermometer population. It makes me wonder if some of the more complex, more difficult methods for putting numbers to the trend like say “total heat” were rejected in favor of the old thermometer because everyone understands – or at least thinks they understand it. I use term “total heat” loosely guessing it has a specific meaning which I might be splattering a bit. 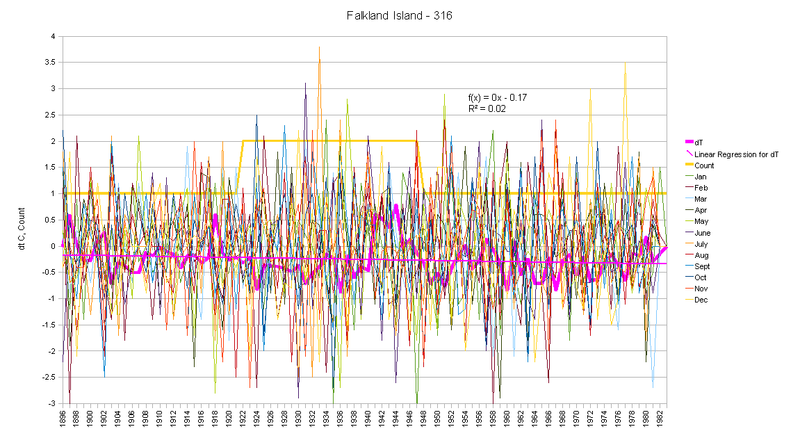 The thing that puzzles me most is that if things actually are warming up a bit, maybe a very little bit, why doesn’t it show in so many of the time series? If the warming isn’t happening, and we think it is, then we clearly don’t understand much about it after all. there’s a disconnect in here somewhere. Interesting. I am off to compare these with some of my files to see what I can dredge up to add. There are good posts at the moment on anomaly calculation at tAV and RomanM’s blog. Well worth a read, although my eyes tend to glaze over (unfortunately) at the code and maths. 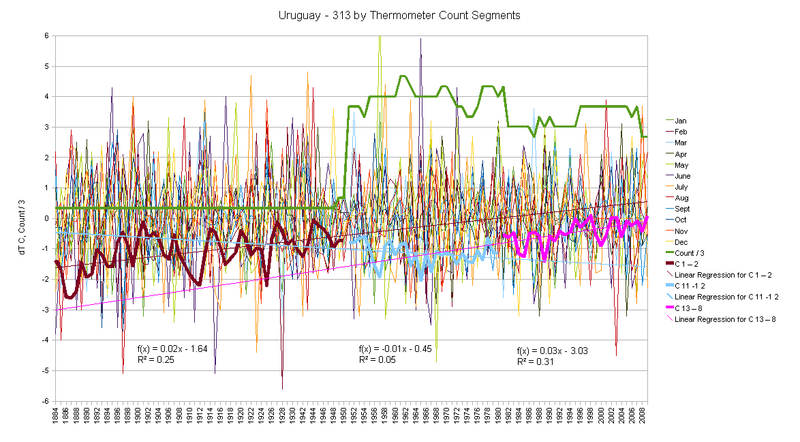 Um, I make it two files for Uruguay (313) – Riveras (86350) and Artigas (86330). 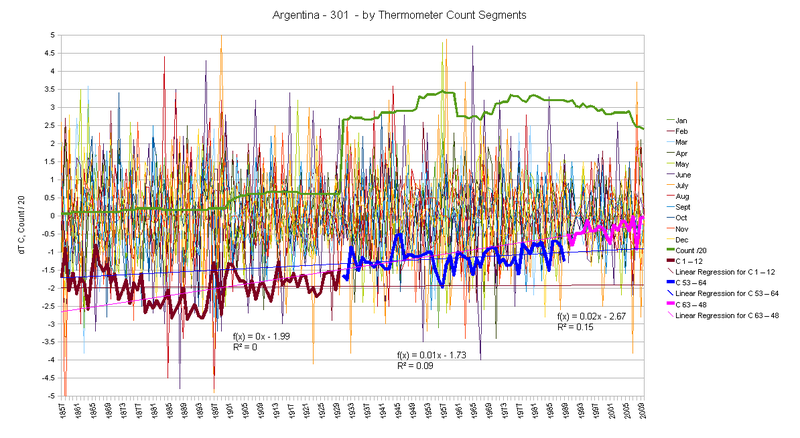 Only Artigas (makes it into the adjusted dataset) – strong cooling trend, lots of missing months and years. 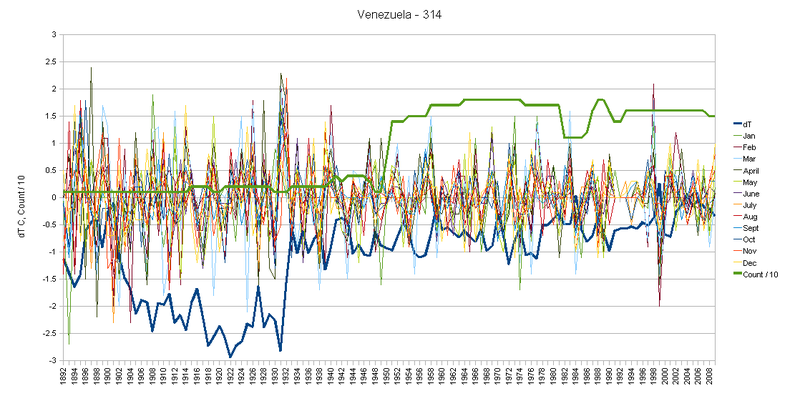 The step change for Venezuela in 1931/32 is unexpected – other than that warm spike. Thermometer count is stable at that point. Er, actually just found an additional 11 files for Uruguay. I was looking at the unadjusted data (downloaded ? early Jan) that does not make it into GISS adjusted when I spotted the other two. The 11 were in the GISS adjusted file. Nine have a strong warming trend; two are cooling overall. Do you guys know where that guy got the two versions of ‘raw’ data that he made all of the blinkers from? As I understood, he just downloaded the raw data at two different times, one a few months after the other, and the ‘raw’ data was astonishingly different. As I understood, it was the purportedly the same ‘raw’ data, with no annoation of why it might have changed so dramatically. My day job reverted to a day-and-night job again, so I’ve lost coherency on this topic. And a good thing, too. It has a very interesting new ‘feature’ in it (that I’ve showcased up top). All good stuff. By the way, this week`s The Economist has a lead article on Spin, Science and Climate Change plus a four page briefing called The Clouds of Unknowing. 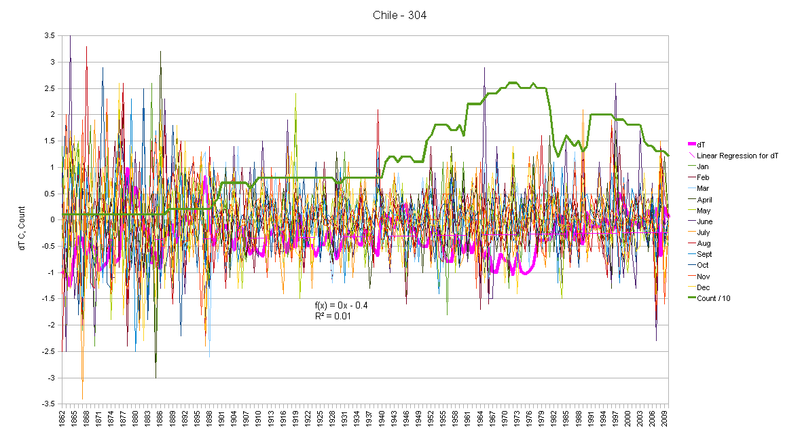 Among other things, it includes a chart of deviation from World Land Temperature 1850-2009. I will alert the editor to the evidence on your site. would it be possible to analyze the data and arrive at an “unusualness” figure for the “lift” and “pivot” across the data sets? This might be a bit like a seismic fault where all the roads come up to the fault on one side and leave it shifted 6 inches to the left on the other? I have no idea what forensic tools you might have but it doesn’t seem impossible that the sets could be looked at together and discovered to be similar in terms of randomness except all agree in 1980 and 1991. If not a gun, then at least the smoke. A mirror maybe? If it isn’t practical to do this, is there a term for the process I’m describing? That is actually an interesting example of how forensics differs from “climate science”. I WANT to see that ‘artifact’ of the bullseye, it tells me where there is a “Dig HERE!! !” event. They want to erase it via further massaging of the process. I consider that a “hide of the interesting bits” they consider it a “valid correction” (and some times it may be, and if so I’ll eventually get there, but I’m not going to hide my clues as to where to look until I”m done looking ;-) It’s just a different goal. Like the auditor who does not just say “the dollars on the reports match” but looks in the vault and says “You have a receipt for $10,000 in quarters but the vault as $10,000 in dollar bills. SOMEBODY has been moving the money around. What’s the deal?” May be a clerical error. May be sloppy process that let someone swap dollar bills for quarters and not get recorded. Or may just be a Madoff Moment and someone stuck a bag of dollar bills in the vault for the day of the audit… so you dig until you KNOW. I don’t know of any Term Of Art for what you describe other than “consistency checks”. It’s looking for the “discontinuity” or the “OOPART” (Out Of Place ARTifact). So what I’ve observed so far is that the Duplicate Number (Mod flag) tends to be zero or 1 or sometimes even a 2 for the “good history” and runs up beyond that for the “Blade of the Stick”. Often a “3”, though some places (especially in Canada and New Zealand…) have a short series of runs then settle down with a higher Flag value like a “5” or “6”. Sort of like someone was running experiments until the worked out what would deliver the goods, then rolled it out to the rest of the world (where you get the “2” to “3” transition more consistently). On the Falklands, the dropping in 1982/3 might be because there was a little bit of argy-bargy (sorry) in the vicinity that year. War can be so inconvenient for temperature measurements. Hmm, good catch on Uruguay. Do check French Guiana (as per comment in moderation) – also looked in my downloaded file of GHCN v2.mean, but you might want to snip part of my comment. Looking at what in radio amateur talk is called a waterfall display where you see a fairly broad width of the band you are receiving and can see the signals here and there as vertical lines, maybe like a spectrograph (if I have the word right). In this case you would be seeing the signals clearly midst the noise. The temps aren’t noise but the steps and pivots are not temperature signals, but they are signals, just not temperatures. I see first sentence in above post isn’t . What I was trying to suggest was that step and abrupt inflexion points or pivots are signals but different from temperatures and would display well on a spectrograph. 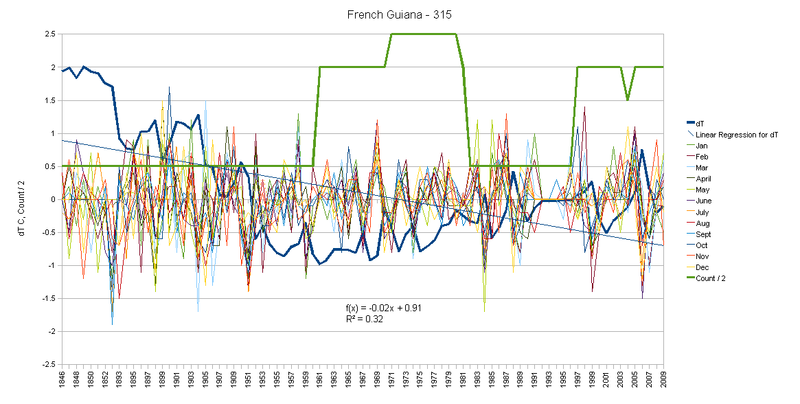 When I look at the French Guiana graph I see a jump from 1909 to 1951 so I think it’s the right stuff. ( I probably need to emphasize that gap in the text). Also note that the thermometer count is marked as “Count / 2” to scale it to fit on the page. So that ending “2” is 4 thermometers. ’71-80 has 5 but that’s probably just multiple Duplicate Numbers (Mod Flags) for some places as they run in parallel. OK. I was just puzzled to see a line in the period 1910-1950. Although there is one active thermometer, there are no actual temperatures in my download of the GHCN v2.mean and GISS station data has only 9999 missing months for that period. I just wanted to make sure you hadn’t found some thermometer I had missed. E M, I am also surprised by the lack of Comments, if the other posters are like me they are just too busy reading your comments and Graphs as well as being slightly stunned. I think this is wonderful work and I just hope that you get recognition for it.